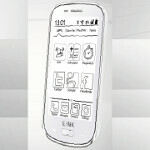 A Chinese company called Fndroid is working with Eink to develop a 3G smartphone that would priced as cheaply as a featurephone. Some of the advantages of such a device would be longer battery life, Sunlight viewability and the display would be easy on the eyes. Fndroid has produced two prototypes that have been displayed at MWC 2013. One model (in white) is equipped with a 1GHz processor and a 3G chip, while the other model (in black) offers EDGE connectivity. And while the phone does run on Android, it has a rather limited UI that concentrates on features that work well with Eink's display such as email, a reader app and a dialer. Obviously, video is not supported, but text from web sites can be read. One of the prototypes has a backlight to help view the screen in the dark, but the screen's refresh rate is a lot slower than what you are accustomed to. If ghosting is a problem, a quick shake of the phone removes it from the screen. According to Eink's Giovanni Mancini, director of the screen producer's product management, Fndroid is currently in the process of talking with carriers about releasing the phone sometime later this year. In the title are you saying this project is a 'Lost Cause' or that it will be 'Low Cost'? I'd like to see someone use a photo editing app on this. You could do some pro color balance. Seriously? Do we really need this? You can get 4G smartphones on contract for FREE nowadays. If this comes to the U.S. which I hope it doesn't, it would have to NOT require a data plan. Would probably good for older people or people with poor eyesight. As well as people who do only want to use the phone for keeping track of appointments, emails, and looking up information. Im unsure what to think of this, this is more of a non camera/video/game phone that would only be ok to text, call,and listen to music on. Can anyone tell me what's the point of running Android on this? Using an outdated version of the OS with more limitations than benefits? Yeah, seems worth it, doesn't it? Thumb me down if that makes you feel better, I'm not bashing the platform, I'm just questioning the purpose of it. Wow! YES PLEASE!!! This is the end for Android's poor batt life.! Looks like the Galaxy S III those rounded phones.